You're 18-years old and starting quarterback against a top 15 College team. No woder Tommy Rees has a bullseye firmly planted on his chest against the Utah Utes . Especially given the fact that Notre Dame may not have a running game after the season ending injury to their top running back Armando Allen. 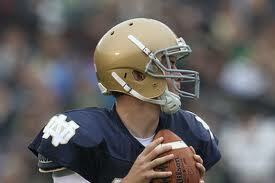 And coach Brian Kelly is known as a spread offense guy who prefers the pass. The Utah Utes will be gunning for him today, make no mistake about it. They pretty much guaranteed it. ""They obviously have a lot of confidence in his throwing ability, as evidenced by his numbers," Utah Coach Kyle Whittingham told the Deseret News. "And so we didn't see any discernible change of philosophy or approach offensively when the switch was made." "I don't think our m.o. changes dramatically because he was very capable when he did throw the ball," Whittingham explained,referring to Rees's last outing against Tulsa . "He did a nice job. His numbers were pretty good." "I think he's got a lot of ability and a lot of upside," Whittingham said. "I hope he throws it that much because that just means more opportunities for the secondary," Burton said. "So I hope he does come up throwing the ball 50 times. We've just got to capitalize when he does throw." "our D-line is a little bit on another level pressure-wise than Tulsa's," Burton said. Let's hope young Rees keeps his cool but it may be a long afternoon.